When Karen McCavour started fishing for scallops with her husband four years ago, she had no idea the mollusks could produce pearls. But over those years she has developed a growing collection, and a nearly perfect pearl discovered just last week is now one of her most prized pieces. The scallop fishery opened on the Bay of Fundy early last Monday morning. Scallops have to be shucked while on board, and that's what crew member Andrew Fowler was doing when he came across the large, round pearl. "Normally, most guys don't see the little pearls because they're shucking so fast," said McCavour. But in this case, he did, and while McCavour wishes she could have been the one to shuck the scallop, but she's happy her crew member turned it over for her to add to her collection. On Saturday, the pearl was on display for customers at the lobster shop in Lorneville, N.B. that McCavour co-owns with her husband. It's one of the biggest ones she's found, and she said it's certainly the nicest. Scallops, like other mollusks, produce pearls as a way to deal with irritations, according to Marine biologist Claire Goodwin, who said they're likely formed to combat parasites. "The scallop protects itself by forming this ball around this ball of calcium carbonate," she said, "around the parasite." 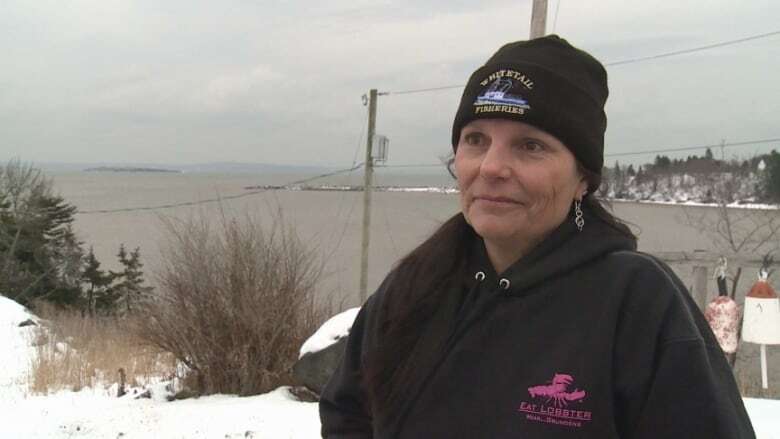 Goodwin, who is a research scientist at the Atlantic Reference Centre in St. Andrews, said there's a good reason why many don't know scallops produce pearls— they're incredibly rare. The Department of Fisheries and Oceans, she said, estimates only 1-in-10,000 scallops produce pearls, and only 1-in-50,000 will produce one which is gem quality. The pearls are similar to others, in that they're formed out of calcium carbonate. But scallop pearls differ from oyster pearls, because they lack the typical iridescent shine. Despite that, that difference, they can be used for jewellery. Craig Fancy works with the Digby Scallop Pearl Company in N.S. and has built a relationship with fishermen in his area. "They are rare," said Fancy, "but they're not as rare as they were to begin with." Last year alone, Fancy said he was able to buy about 2 kilograms of scallop pearls off local fishermen. The price he buys them for, he said, depends on their quality. But he said he sold a 20 inch strand of the pearls last year for $1,100. McCavour has had some of the scallop pearls she's found turned into jewellery, and she's auctioned some of the pearls off to local charities. But this one, she said, is too perfect, so it will stay in the family, even while she continues to search for more. "It keeps my mind occupied when I'm out there shucking, believe me" said McCavour.